Halloween Night left Twins Jazz relatively empty; most opting for traditional Halloween parties. 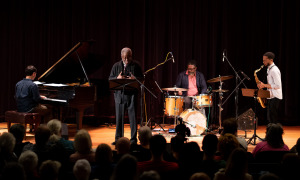 But that didn’t stop the Benito Gonzalez Trio and young tenor titan Ron Blake from blazing through two sets of forward-thinking originals and standards. The Venezuelan pianist has made quite a name for himself, paying his dues on the D.C. scene since his arrival in 2001. 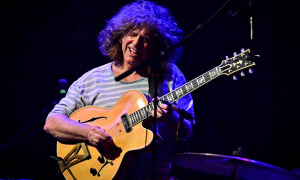 He recently finished a two-year stint at the local “center for the preservation of jazz and blues,” HR-57. He has a weekly spot at Columbia Station in the center of D.C. nightlife, Adams Morgan, and a demanding schedule all over the D.C. metropolitan area as an in demand pianist. 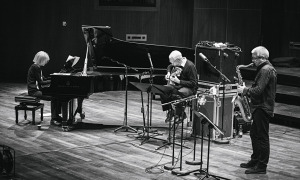 Gonzalez’ approach is steeped in both hard bop and contemporary jazz, showing particular signs of Horace Silver, McCoy Tyner, Herbie Hancock, and Kenny Kirkland. He has a particular penchant for ridiculously fast chromatic right-hand runs (a la Bud Powell). Gonzalez opened both sets with originals entitled “@ Gonzalez,” “Starting Point,” and “The Walker,” each rich in harmonic texture. While Blake blatantly was learning on the spot from a scribbled lead sheet, the seasoned pro picked everything up quite easily. 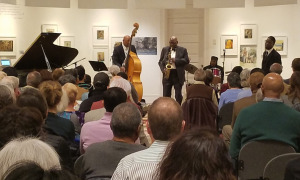 In fact the whole evening had the spontaneity of a jam session, each musician bringing an excellent sense of rhythm and knowledge their respective instruments. Bassist and regular Gonzalez cohort, Gavin Fellow provided solid support and jaw-dropping chops in his improvisation. 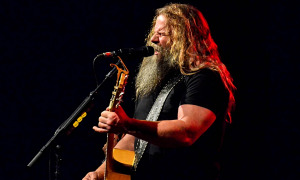 Whenever he set into solo-mode, he grit his teeth as he entered his element and transfixed his gaze on a spot in the audience (much like a drummer does when trying to keep a steady beat behind everything else he’s hearing). Very rarely have I seen a bassist that exuded such control, passion and a clear indication of extensive listening. A native of the Washington area, Fellow is quite busy himself as an in-demand sideman (he is largely self-taught as I understand it). Gonzalez noted that he first saw Blake with the Roy Hargrove Band (a group in which Blake played for a number of years) and met the Virgin Island native at Twins a few months ago. 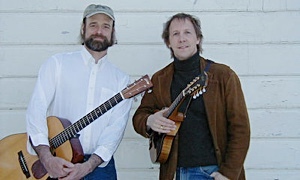 The remaining member of the rhythm section was Steve Altenberg, a native of D.C., but a current freelance musician in New York. Altenberg’s stick work was extremely impressive, given he was only using a four-piece set, two cymbals, and high hat. 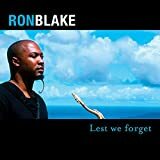 Saxophonist Blake, has just released a new CD ( Lest We Forget ) co-produced by himself and friend Christian McBride on the Mack Avenue label. 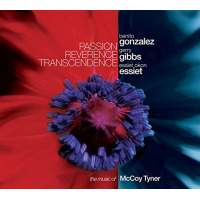 His playing on the Gonzalez gig was inspired and fiery. Excellent rhythmic feel characterized his approach as well as a great ability to communicate with Gonzalez and together, stretch out on many tunes. The group jammed out on several grooves and montunas (whichever you prefer), and played several classics including Jack Baker’s "I Hear a Rhapsody", Burke & Haggart’s "What’s New "(on which Blake sounded just like Trane), and "What is This Thing Called Love". Look out for Gonzalez in the next few years as he plans make a move to New York and record with Blake, drummer Antonio Sanchez, and a few other yet to be named cats. His style is very modern and aggressive. His professional relationship with Jackie McLean and son, Rene, will surely be of help to Gonzalez when he does make the move (his website contains some soundbytes of him with the McLeans at Iridium a while ago). However, given the way he currently plays he can hold his own practically anywhere he goes and whomever he is up against. 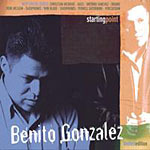 Visit Benito Gonzalez on the web at www.benitogonzalezmusic.com .